Samsung GW731KD-S/XTL - Worth of Your Money? In our running life, we really in need of a reliable helping hand that will reduce our workload and simultaneously can do a lot of work in a small amount of time. Cooking is our daily work and our prepared meal should be delicious as well as healthy and whenever a question arises, is there any appliance that will do our cooking faster as well as gives tasty and healthy food? 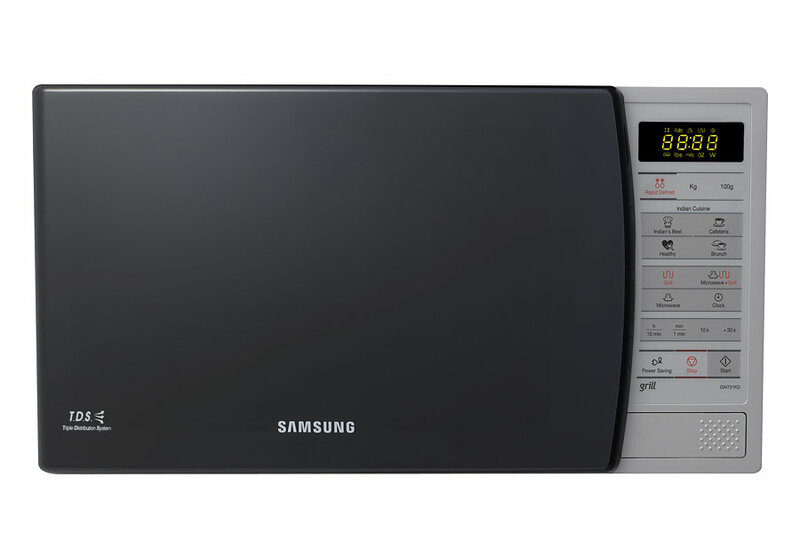 Samsung GW731KD-S/XTL Microwave Oven Review – Good Or Bad? The answer is very simple, that for cooking, there is no match of Microwave Oven when we need fast cooking keeping the food’s taste and quality intact. But, you have to choose the best Microwave Oven that will fulfill all your requirements and which will have a range of facilities with a very affordable price. But, you don’t need to worry now as after reading this article, your all worries will get finished and you can enjoy your cooking as never before. If you don’t have the enough time going through a cookbook or find the appropriate recipe then no need to worry, as Samsung’s microwave has an impressive feature of the auto menu. It will think on behalf of you. Now, you don’t need to memorize the cooking times and temperatures, you just have to select a menu and then press the button for preparing your favorite meal. It will come out perfectly and get ready to taste a finger-licking delicious meal. If you have lesser kitchen space, then you don’t have to worry. This Samsung’s microwave will be perfectly fitted in your slim size exterior. Thus every interior will be in perfect harmony. Defrosting of foods take a lot of time and it is quite annoying. But after a lot of waiting, you can experience a food that may be soggy in some places and rock hard in other places. But, now with this Samsung’s microwave’s Rapid Defrost feature, the frozen foods will defrost evenly and quickly and they will revert back to their pre-frozen and fresh state. Now, are you ready for a delicious dinner? In the conventional wave distribution system, the distribution of the microwave is happens through an aperture antenna. This Antenna has high in efficiency, but low in low distribution capacity. In this case, the problem is the microwaves are concentrated to a specific part of the food. To overcome this situation of uneven heat distribution, the Samsung has developed Triple Distribution System. With TDS, the every part of your food will be cooked evenly with an aperture antenna and 2 additional slot antennas. These ensure wide distribution of the waves. It’s Max Cooking Time is 60 Min. Its Heat Source is Grill. Its power source is 230V/50Hz, maximum Output Power is 750W and Microwave Power Consumption is 1,100 watts. It has 6 Power Levels. It has LED Display Type. It has Mechanical Control Method. Its Door Opening Type is Push button. The Microwave Distribution is Turntable. Its Cavity interior is Epoxy. It has 44 auto cook menus. It has an amazing feature of Eco button that enables the user to save the standby power up to 40%. In a nutshell, just push and save the power, the money, and the earth. It has 5 years of warranty. It has the power of 750 watts and its Operating voltage is 230 volts. It includes 1 Turn Table, 1 Grill Rack, and 2 Pizza Base. It comprises of Microwave oven, Instruction manual and Warranty card, and Round rack. Now, your search for the best and reliable Microwave oven ends here. Buy Samsung GW731KD-S/XTL Microwave today and bring your home happiness as well as give your adorable kitchen a lovely gift. Karcher WD3/MV3 – Best Performing Vacuum Cleaner?